If a picture is worth a thousand words, and a disappearing picture is worth $800 million, what’s an idea worth? Reggie Brown filed a motion on Thursday in a California court to disqualify Evan Spiegel, Bobby Murphy, and Snapchat’s attorneys, Quinn Emanuel. 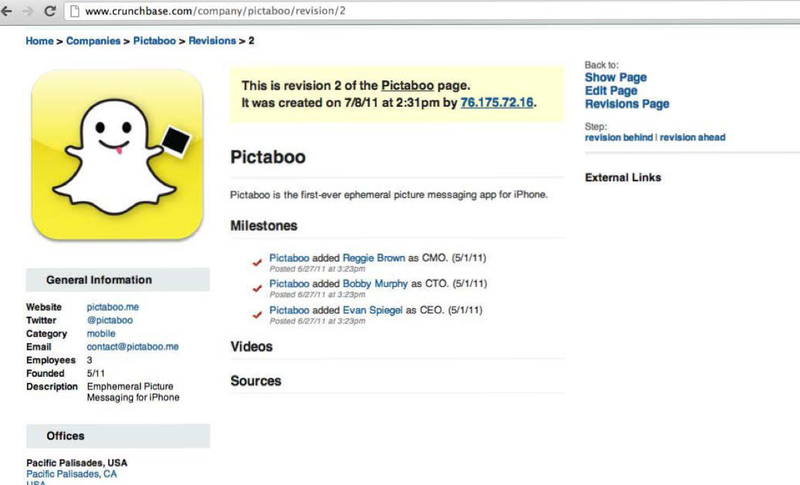 The documents also show evidence that may support Brown’s claim that he is a co-founder of Snapchat. In February, Brown sued Spiegel, Murphy, and Snapchat, claiming he co-founded the popular photo messaging app, which just raised $80 million at an $800 million pre-money valuation, and was forced out by Spiegel and Murphy. Spiegel called the lawsuit “utterly devoid of merit” in February. Brown’s filing on Thursday included some of the evidence that had been found by Brown’s lawyers during the discovery stage. This corroborates what sources told me in March regarding the founding of the company, and obviously is a blow to Snapchat’s public image, as Spiegel and Murphy had previously denied Brown’s claims and said the idea was solely theirs. While it’s sort of interesting that Murphy wasn’t Spiegel and Brown’s first choice for their coder, sources say he has done a great job leading the technical aspects of the application and company. Bouncing ideas off friends and being rejected by busy classmates is also commonplace. Nothing really new here — this is basic evidence showing that Brown worked with Spiegel and Murphy in the summer of 2011. The cake picture has circulated on all the blogs; nothing new here. While Brown’s lawyers paint Spiegel as a mindless frat bro, the full email chain shows a much shrewder Spiegel managing the media and having a long-term vision for the product. Sources told me Brown’s original idea for the app arose from a conversation about sexting; indeed, the blogger Nicole James immediately jumped to sexting when Spiegel pitched the idea to her. “Ahh, okay. So it’s like, the best way to sext, basically. Cuz you can’t save the images?” James wrote. “Some people use it for that..but it’s also the best way to quickly share an ephemeral moment with a friend ­- think celebs (blake lively? ), cute guy on the street, where you are…it makes the images you send special ­ the most exclusive photos in the world haha,” Spiegel replied. “I like it,” she shot back. “Blog target #1 ­acquired,” Spiegel wrote to Murphy and Brown. “My internet friend Evan [Spiegel] created this app called Picaboo whereby you can send a photo to anyone else who has the app, but you set a time limit on the photo, and it’s only from one to ten seconds. There is NO WAY for the person to save the photo. Imagine all the n00dz you’d get cuz people would feel so safe about it!!!! Even though James still thought the app was for sexting and pitched it to her readers as a sexting app, she herself was using it in the same way as most current Snapchat users: as a personal photo sharing tool, just as Spiegel envisioned. This also corroborates what sources told me in March — that a patent argument caused Spiegel and Murphy to shut Brown out of the company. However, the patent was not the one for single touch photo/press and hold video, which Spiegel and Murphy filed in August 2012. The patent discussed here was much broader, essentially for an app for disappearing photos. 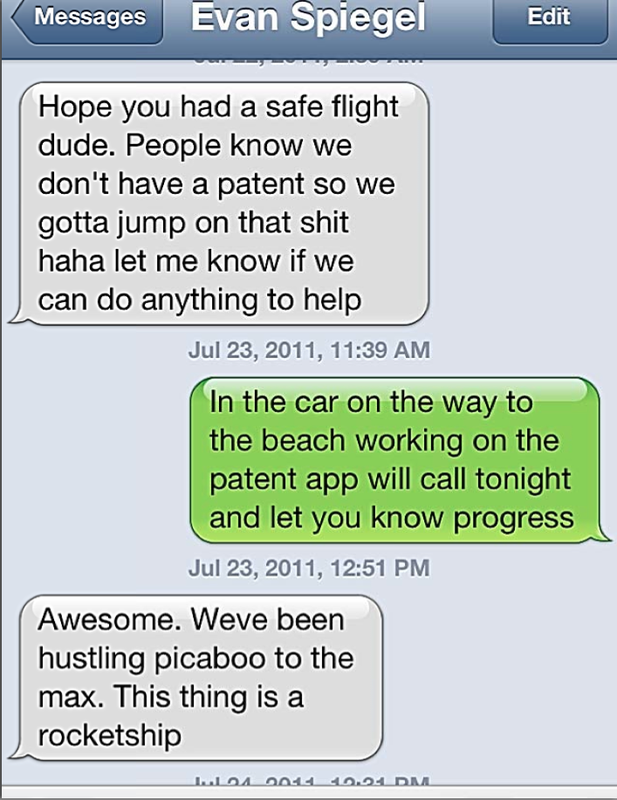 A letter from Cooley LLP, representing Snapchat, to Brown in May 2012 alleges that Brown’s ownership claims were tied to this patent. In the Cooley letter, the firm argues that “unless and until a patent issues…your claim is to 1/3 of nothing.” The patent has not yet been approved, and has likely been removed by Spiegel, Murphy, or Brown. A representative from the United States Patent Office previously told me an “inventor can ask for an application not to be published at all until the patent is actually issued.” The patent is eventually abandoned if it is never issued, and if an application has multiple inventors, any of them can file a non-publication request. Meanwhile, Brown’s lawyers are pushing for Brown to receive a full third of the company — not an equal share to Spiegel and Murphy. The two sides will meet in court on August 1 to address the motion to disqualify Snapchat’s lawyers.